All your common beauty myths busted. 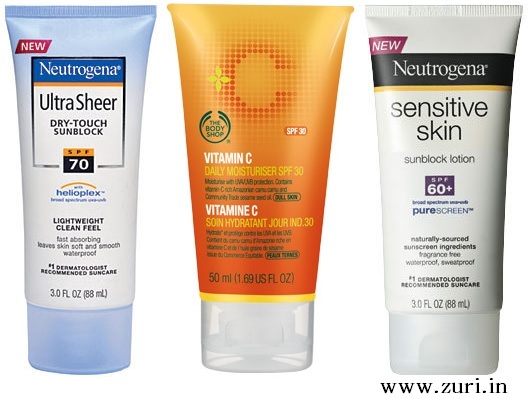 Myth #1: You need to wear sunscreen only when you are out. Fact: The most effective way to delay the signs of aging is by applying sunscreen every single day, come rain, hail or storm. Did you know that ultraviolet radiation seeping through CFL’s damage skin cells? Wear sunscreen indoors too – you never know which UV rays harm your skin when. Myth #2: Moisturizer on oily skin will make the face and makeup look even more oily. Fact: Untrue! The texture and finish of the foundation or powder will determine how your skin looks after. Skin care is most crucial as the skin requires hydration. Use an oil-free moisturizer before putting on makeup and notice how effortlessly the foundation blends. A great trick famous makeup artists swear by is to just powder the T-zone so the rest of your face still maintains a dewy, natural texture. Myth #3: You’ll eventually outgrow acne. Acne is caused by eating oily foods. Over-cleaning your face helps to clear acne. Stress causes acne and the list goes on and on and on. Fact: So wish this were true! Acne can show up at anytime and at any age. Even if you had clear skin as a teenager, there’s no guarantee that you won’t get acne later. Maybe during pregnancy or perhaps during menopause. As long as your hormones function, acne can show up! Women’s hormone levels fluctuate throughout their lifetime, which is why many women experience breakouts around their menstrual cycle. Acne is also believed to be caused by eating oily foods. There might be some foods that can trigger acne in an individual due to some allergies, but there is no evidence to prove that acne is formed mainly by eating some foods. Since acne is a function of the hormones, no scrubbing or ‘deep cleansing’ is going to help. This would in fact trigger the inflammation making acne worse. An exfoliating product that contains salicylic acid or glycolic acid can make all the difference in reducing acne and the marks it leaves behind. It is also believed that stress can trigger acne. But no one is sure how that works! Myth #4: Each one of us needs to use an eye cream. 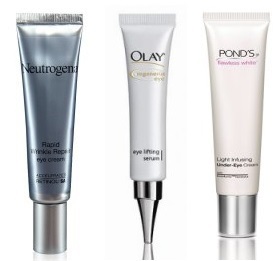 Fact: Eye creams are a craze designed to extract your money by the sale of two products when only one is needed. Basically when you go to a skincare counter, they try selling the cream by saying that the eye area doesn’t need ingredients that cause irritation. Uhhhh… isn’t that the case with our face or even the whole body? I have dry skin around my eyes mostly and the rest of my face is a combination of oily and dry. So for my eyes, I apply the same moisturizer with my ring finger and massage it all over. I don’t need a specifically labelled ‘eye cream’ for this! Myth #5: Expensive cosmetics are always better than inexpensive ones. Fact: Well, the truth is that there are good and bad products in all price categories. It’s all about what suits you and your skin. The quality of the product and the uniqueness of the formula is what makes a certain product stand out. An expensive toner that contains alcohol, peppermint, menthol etc and irritates the skin will definitely be trashed as compared to an inexpensive non-irritant one. Myth #6: Drink more water if you have dry skin. Fact: Drinking more water won’t help dry skin look or feel better. Too much moisture, like a hot water bath, is bad for skin because it disrupts the skin’s outer barrier. 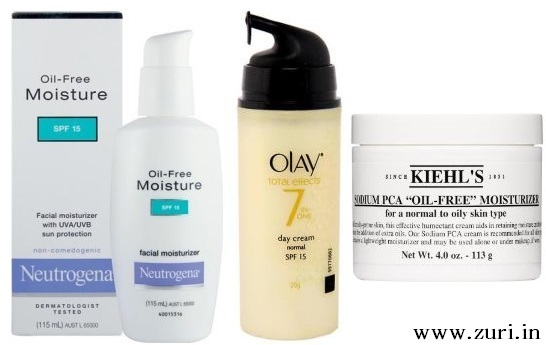 To prevent dry skin, avoid and reduce anything that damages the outer barrier, like sun damage or products that contain irritating ingredients like alcohol, drying cleansers, etc. Keeping your liquid intake up is fine but excessive drinking will not solve your dry skin related problems. Imagine if all the dry skin problems were solved just by drinking water – the skincare market would suffer the most and moisturizers would stop being sold! Myth #7: A cream or moisturizer applied at night must be labelled ‘night cream’. Fact: A moisturizer that is worn in the day will contain SPF and a moisturizer worn at night will not. That’s the only difference! I often hear salespeople say that the skin needs different ingredients at night than during the day as it does more repair work at night. Honestly, that isn’t true as there is absolutely no list of what those ingredients should be. You do not need SPF while you’re sleeping, because it’s simply not what your skin needs. Sunscreen is worn during the day as it prevents skin from being damaged by the harsh environment and that’s not what’s required for the skin at night. So allow the skin to relax at night with a moisturizer without SPF that will aid your skin while it’s in repair mode. For night time wear, use a simple DIY alternative like almond oil or Vitamin E cream.